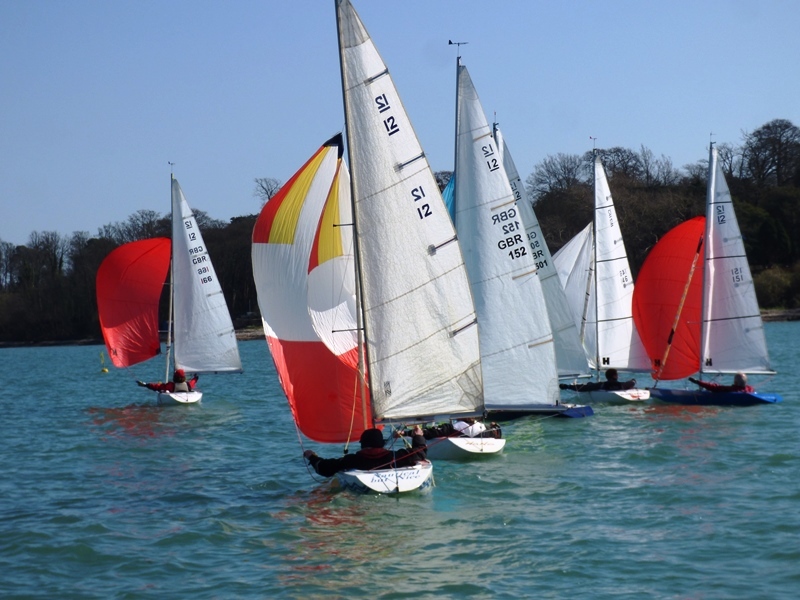 After the strong winds over the last couple of weekends, the calmer weather of the last few days helped draw sixteen ‘Illusionists’ to Bembridge on Saturday morning for the opening day of this year’s Spring Plate. With conditions outside the harbour looking favourable, the Committee Boat headed out and anchored off Silver Beach to wait for the fleet to beat out against the strong incoming tide. After nearly a twenty minute postponement the first race got away to a clean start bar Jamie Scrimgour who got himself stuck mid line and took a long time to get back. It was good to see Rolly Wilson (who was back for his first race of the season) tack off to the right side of the course and taking advantage of the 20 degree wind shift round the windward mark well ahead of the rest of the fleet. 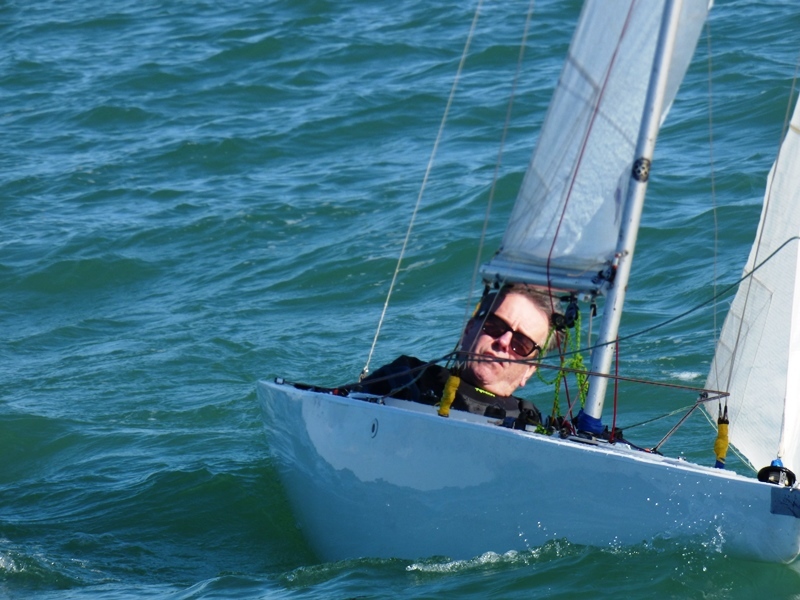 With the breeze holding North Easterly, the course was reconfigured as they headed to the leeward gate; sadly for Rolly he misunderstood the ‘change of course sound signal’ but he took it in good spirit as he lost his lead to Philip Russell, Rosie Gosling and Jo Downer. Fourth to sixth place saw some very close finishes with Andy Christie just coming in ahead of Mark Downer and Charlie Egerton-Warburton. 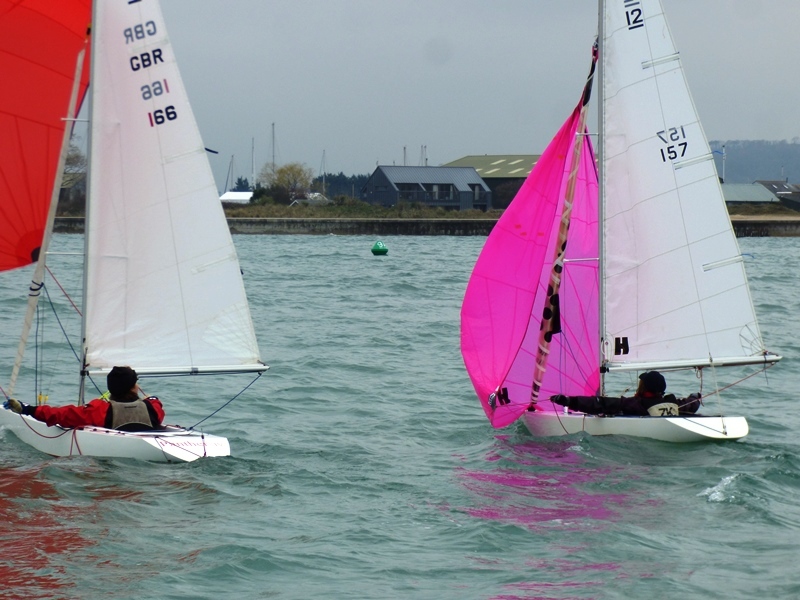 With the breeze settling down to just over 8 knots, the second race got away to a clean start. Going right appeared to be the most favourable route to the windward mark although lots stayed to the left. First round was Mark Downer just ahead of Julia Bailey & Jo Downer with Owen Pay, Hugh Doherty and David Peerless close behind. 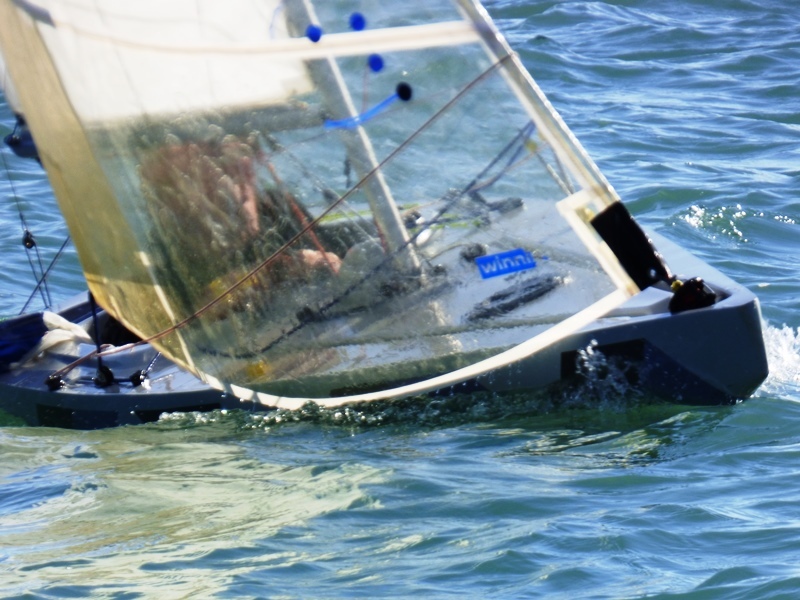 On the first run to the leeward gate Jamie Scrimgour, Rolly Wilson and Jonathan Nainby-Luxmoore had a slight altercation which ended with Jamie retiring. On the second round, Mark extended his lead while Julia & Jo battled it out for second and third place. 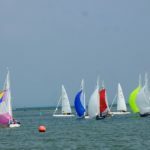 With a slight increase in the breeze and the sea building slightly, it was decided to go for a third round and to then stick with three races. With Mark too far ahead to worry about, Julia & Jo continued the battle for the next two places. In the end Jo got ahead to take second with Julia third. David Peerless was fourth and Hugh Doherty was fifth. Having looked as if the breeze was going to continue to build during the third and final race of the day, in fact the opposite happened and after a good start with most of the fleet remaining on starboard, it dropped back down to 6 knots. This made keeping the boats moving through increased ‘slop’ quite hard work. Rosie Gosling and Mark Downer led round the windward mark with Rolly Wilson, Olly Laughton-Scott and Julia Bailey not far behind. With no sign of the breeze picking back up again, the race was concluded after 2 rounds with Mark picking up his second win of the day. Rosie was a very good second ahead of Julia with Rolly just beating David to the line for fourth place. 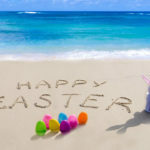 Bright sunshine and a gentle Northerly, forecast to back to the West greeted seventeen enthusiastic sailors on Sunday morning. Like the previous day, it was decided to head outside the harbour to allow more flexibility if/when the wind changed. 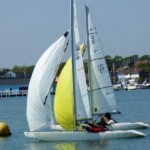 After another fairly lengthy postponement while the fleet beat out to the Committee boat anchored off Silver Beach, the first start got away smoothly and boats headed towards the windward mark set for the 6 knot Northerly breeze. Those who stayed on starboard soon realised the error of their ways as the breeze disappeared on the left side of the course allowed those on the right to make the windward mark without undue difficulty. 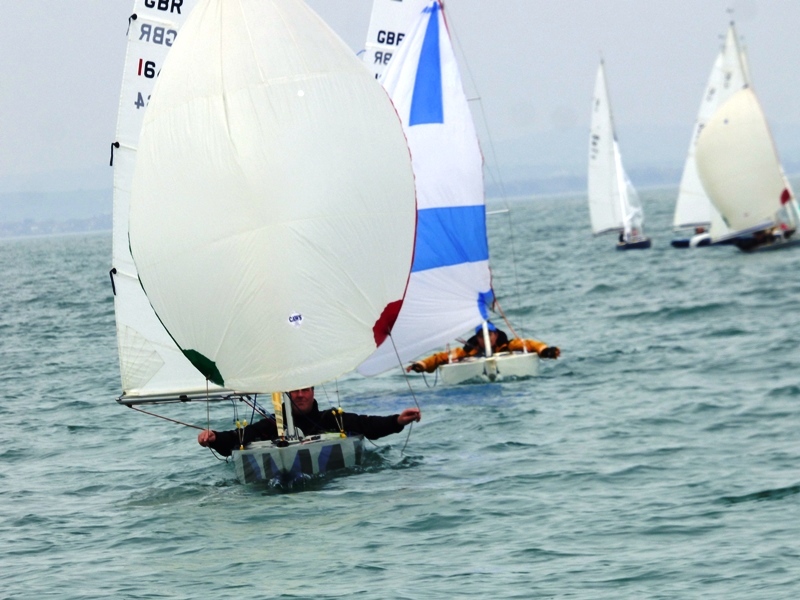 First to round was John Raymond with Mark Downer in hot pursuit, however on the run to the leeward gate John was swamped by the chasing fleet and found himself well down the order. 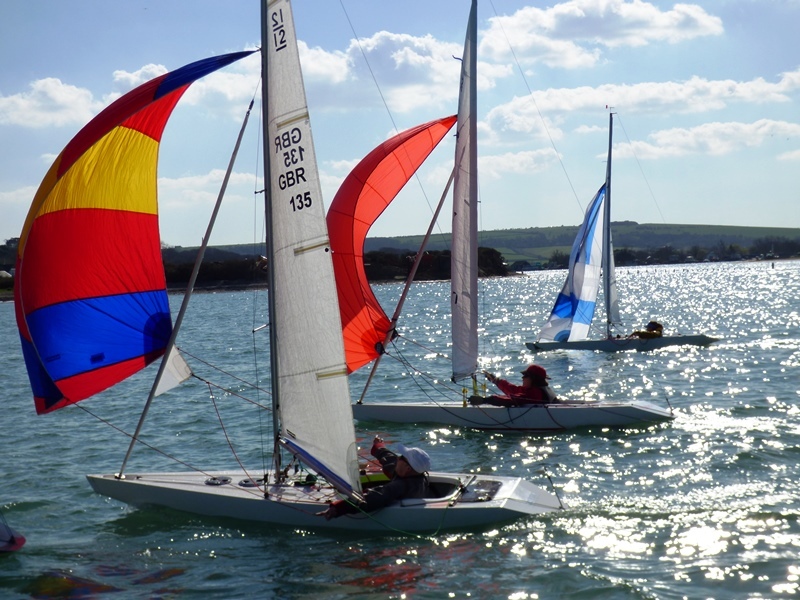 As they began the second round, Jo Downer was in front with Mark well down to leeward and Andy Christie & David Peerless not far behind. Unlike the previous round, it paid to stay left which meant that Mark took over the lead with Philip Russell, Andy, Alastair Speare-Cole & Robin Ebsworth close behind. As they headed back down the course the wind backed 45 degrees which meant a reach to the leeward gate and the line where the race was finished. Mid-fleet Rosie Gosling and Mike Issaias tied for 10th place. 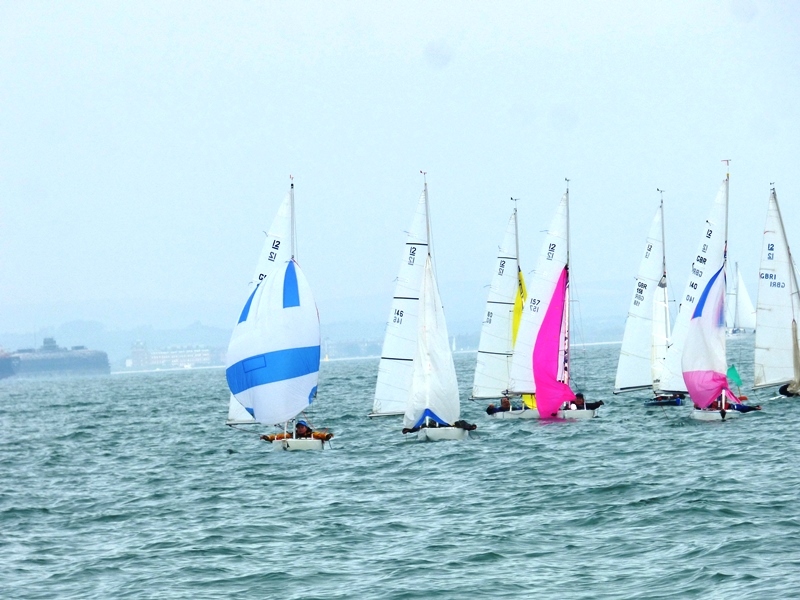 With the breeze now Westerly, the course was re-set before the start of the next race. John Raymond just over cooked it at the start so had to return; the remainder soon split tacks in the hopes of finding the stronger breeze. Mark was again first to the windward mark, with Alastair, Hugh and David ahead of the rest of the fleet. In the second round Mark extended his lead over Alastair while Hugh and David battled for third and fourth. 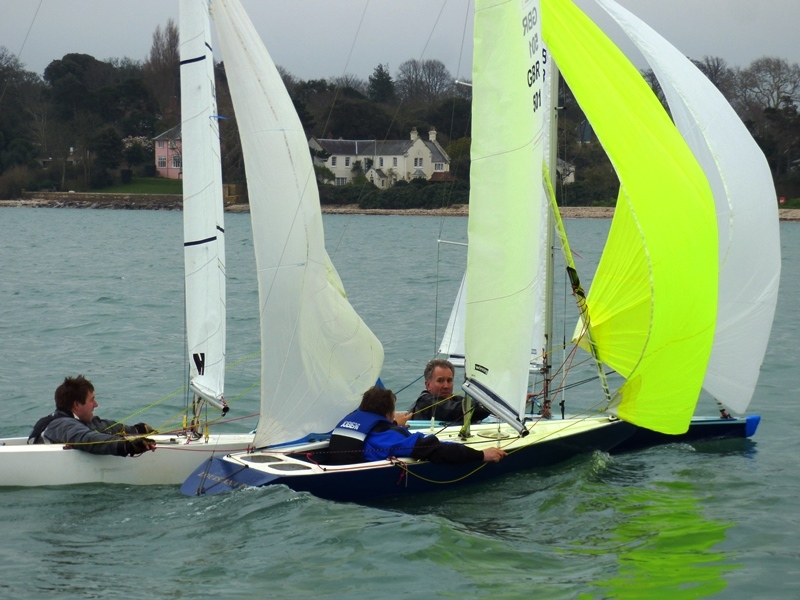 As they approached the leeward gate David got his nose in front but Hugh ended up crossing the line a couple of boat lengths ahead after choosing the left side of the course back to the line. The breeze held fairly steady for the start of the third race of the day; Rolly Wilson got away with being called OCS as the sun made spotting extremely difficult and as in the previous race the fleet soon split tacks and enjoyed some ‘champagne sailing’ as the breeze picked up to 10 knots – it really was almost perfect. 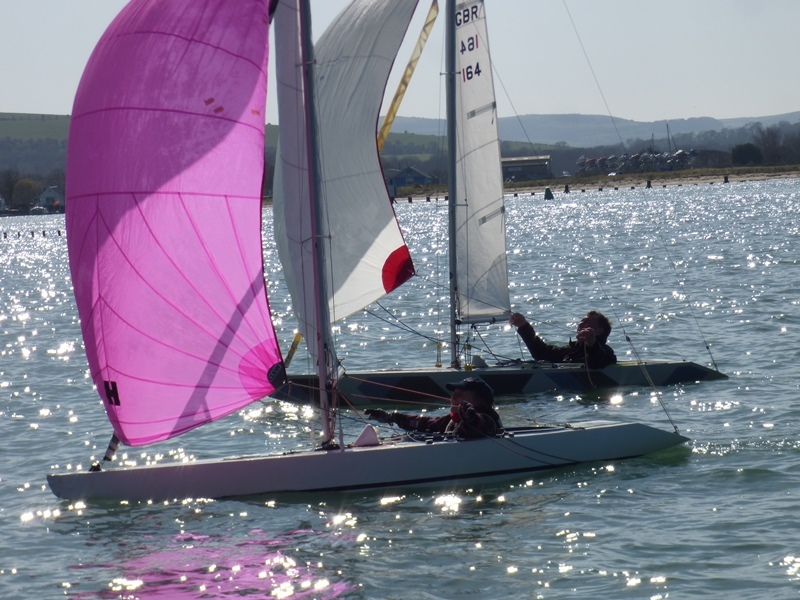 Although it was Julia’s pink spinnaker that was the first to appear after the spreader mark, Mark, Jo, Rosie and Bill were not far behind. 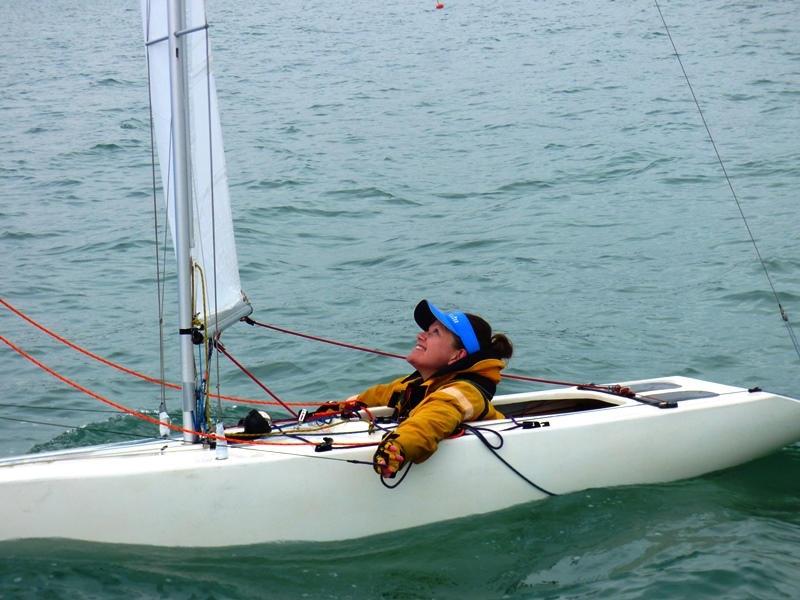 As the two round race developed it looked as if she was going to hold onto her lead, however on the final beat back to the line she had a problem stowing her spinnaker which let Mark through for his third win of the day. Bill Daniels was third just ahead of Jo. Having decided that it was just too nice not to go for a fourth race, it then turned out to be something of a mission to get the race started! There was a General Recall for the first start and although the second start saw Flag U being flown, this too was terminated with a General Recall! This brought out the Black Flag for the first time this season! Although there were a few who risked all, in the end no one was disqualified in what was an excellent start. It was no great surprise that Mark was again first to round the windward mark; Bill and Julia were not far behind and although at one stage on the first run it looked as though Julia was going to get ahead, it was not to be and Mark finished at the windward mark after two and a half rounds well ahead. Trading tacks with Bill, it was nip and tuck for second, but in the end she crossed the line a few inches ahead. 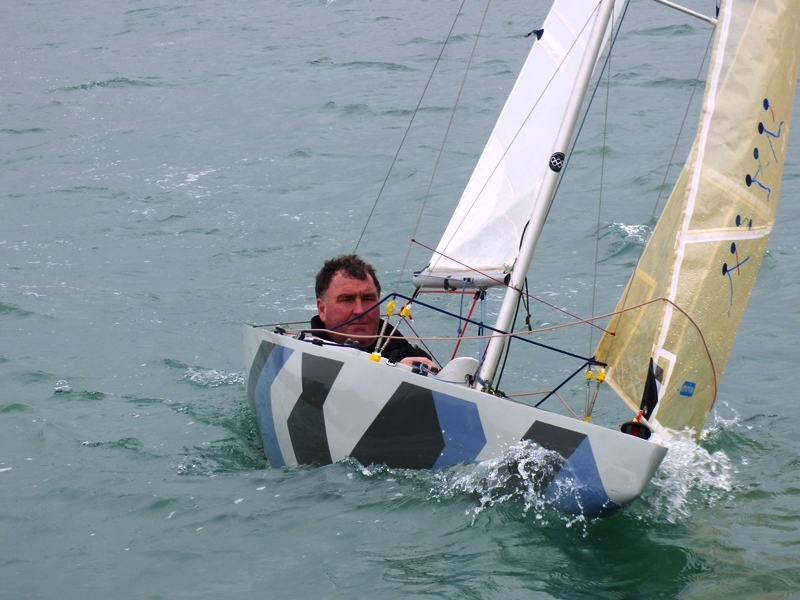 David Peerless, Andy Christie and Jo Downer also had a very close finish with only inches separating them. Overall some excellent racing; Mark retained the Stratton Spring Plate for the second year running with Julia second, a point ahead of Jo. No racing next weekend. The following Saturday (6th April) is the St George’s Day trophy with the Woodford Long Distance race on the Sunday.